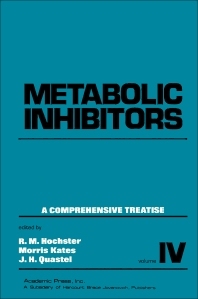 Metabolic Inhibitors: A Comprehensive Treatise, Volume IV reviews developments in studies of inhibition of metabolic and enzymic processes ranging from photosynthesis and blood clotting to protein synthesis, fatty acid metabolism, and phospholipid metabolism. The book also explores the inhibition of specific enzyme reactions, such as amino acid activation, amino acid hydroxylation, and cyclic AMP formation. Organized into nine chapters, this volume begins with an overview of allosteric inhibition and inhibitors, and then discusses amino acid hydroxylase inhibitors. The reader is also introduced to inhibitors and activators of enzymes that regulate the cellular concentration of cyclic AMP. In particular, the book describes the role of lipids in the activation of adenyl cyclase by hormones; modification of adenyl cyclase in various physiological and pathological conditions; and synthesis of glycerophosphatides as well as phospho- and glycosphingolipids. This book is a valuable source of information for biochemists and medical research workers as well as virologists, microbiologists, plant physiologists, and agronomists.